If you wanted to recover the most money from tax cheats then you might think that auditing the country's highest earners would be a good place to start. Not if you were the IRS you wouldn't. No, the IRS tend to concentrate their auditing efforts on America's poorest counties and poorest families. 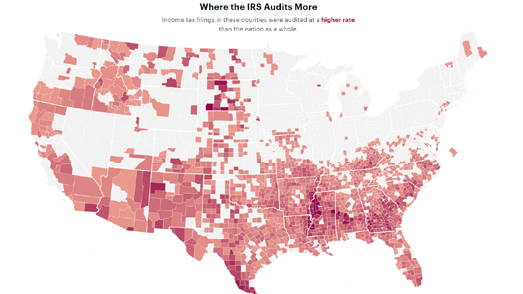 ProPublica has mapped Where in The U.S. You Are Most Likely to Be Audited by the IRS?. When reading choropleth maps of the United States, whatever the subject data of the map, you should check to see if the 'black belt' is revealed on the map. It only takes one glance at PropPublica's map to see that poor counties in the South-East of the country are being targeted by the IRS. There may be no logical reason why the IRS would target the poorest people in the USA but ProPublica's map of the counties audited at the highest rate shows that poor, predominantly African American, rural counties in the Deep South are the most audited. ProPublica says that the reason why poor counties tend to be audited more than richer counties is because of Republican pressure on the IRS to target families on income tax credit. The IRS audits about 11,000 returns in Mississippi every year. It would be interesting to know the cost of those audits and how much money was actually recovered. The ProPublica article includes another choropleth map which shows the least audited counties in the country. These counties tend to be middle-income communities with largely white populations.